Another of Topic's May 2000 releases of traditional singing - or a re-release in this case. This was, I understand, initially intended to be a new release - a compilation by Keith Summers of the best of all the available Sam Larner tracks - and as such would have been extremely welcome. This is not to suggest, of course, that this classic 1961 Folkways LP, re mastered and sonically cleaned on CD is not a welcome addition to the growing collection of good traditional singing now available in this medium - far from it. But it is also, regrettably, far from what had been hoped for. Sadly, it seems that Peggy Seeger has caught the Lomax Foundation's affliction - requiring 40-year old productions which have acquired classic status to be re-released in exactly the same form as the original ... same content (only 60 minutes duration), same notes, same cover illustration ... Why not insist on 12" vinyl, then? One might imagine that she was unaware that the same recording has been available on cassette from Musical Traditions for the past dozen or so years. That production (MT Cass 203) will be withdrawn from our catalogue once the remaining copies have been sold ... could be a valuable collector's item in a few years? This cassette is a reissue of the recordings unedited, unaltered, entirely the same - that first appeared on Folkways under the same title in 1961, and were made by Ewan MacColl and Peggy Seeger. It was, and still is, a superb item. Inevitably, and the paucity of comparable material is probably a factor in this, it has taken on mythical status, but if you are coming to it for the first time then try to forget words like 'important', 'seminal' and 'crucial'. Forget 'glimpses of bygone days' and 'last living this, that and the next thing'. Forget Radio Ballads and 'everyday speech of the working people' and just listen to the man sing. Singers enjoy singing but few show it as much as Sam Larner. His voice breaks into a chuckle at the least opportunity and his pleasure is evident. Timing, control, and indeed pride are also prominent, but it is the sheer joy of the performance which is most striking. There are many who would criticise this, arguing that the singer should retreat behind a mask of neutrality, as most traditional singers do. There are as many who have cringed when singers have overempathised, to the embarrassment of everyone but themselves. Larner gives the lie to the former and would not upset the latter. He was not delivering an art-form; he was enjoying a song, and he therefore felt no compunction about stopping mid-verse for a chuckle or a spoken comment. I would like to know whether these were completely spontaneous or whether they had grown into the performance in the course of time, but it's not important. The performances are entertaining. Say no more. When first released in 1961 these recordings were unusual in the inclusion of speech. This has been done since, and written contextualisation has become the norm. In 1961 this was a bold idea, intended to reflect, quite rightly, that the songs were just a part of the whole person, and that they were a part of the singer's life both past and present. The spoken elements here and the selection of songs form one of the two 'folk tales' which surround this recording. Like all good tales they have doubtless grown in the telling and are far beyond confirmation but, like all good tales, they are worth telling again. The first is that Sam Larner was not at all happy about the selection of speech on this recording. He felt that he came across as 'a dirty old man'. Conversations with friends are not always appropriate for publication. I find this believable. and can recall a number of traditional singers - Percy Ling springs straight to mind - who would always ask 'Are we in good company?' before singing more 'adult' material. I have heard that Bob Roberts and Harry Cox were equally cautious not to take any risk of causing offence. Sam Larner's concern back in 1961 may have been personal. I suspect that in 1994 the issue is more blatant and likely to find less acceptance. The second issue concerning Sam Larner's recordings for MacColl and Seeger is better known. The extreme version of it is that Sam Larner sang The Shoals of Herrin'. Conscientious reviewer and seeker after the truth that I am, I have gone back to Reg Hall who was present on the occasion where the story originated. He tells it as follows. Reg was at an Irish session (he can't remember where) in company with Lucy Farr and her husband Eric, who was English and not connected with music in any way. Someone, or group, (again he can't remember who) sang The Shoals of Herrin', which was enjoying contemporary popularity in Ireland. Eric Farr commented, 'I remember that being sung years and years ago.' Asked to explain. he said 'I used to hear that when I was evacuated.' Asked to where he was evacuated he replied, 'a little place in Norfolk called Winterton.' This has been variously interpreted as evidence that MacColl plagiarised or borrowed the song, through to Hall's generous view that it indicates how well MacColl recreated the traditional idiom. Reg cannot recall Eric Farr's actual words and this is clearly vital. Did he say 'I remember' or 'That reminds me'? The difference is obvious and important but Reg cannot remember. To me it seems impossible that the song is not substantially MacColl, the tune at least is so like him and the form is overly scholarly. Still it may be that some reader of Musical Traditions has additional information. This re-release does not include the extensive documentation that accompanied the original record. Many will applaud this, claiming that verbiage obscures and hinders the music. Others will regret it, and indeed bits of the original documentation are very interesting, regardless of their possible value to the listener. Reading the old notes again after many years, I am brought up twice by references to 'hootenannies'. I was not attending venues like those referred to until the middle '60s, but this serves to remind us of the dominance of American music and style in the clubs those days. How Larner must have surprised the audiences of Central London! There's an interesting comparison to be made here with another re-issue of almost the same era. 'Farewell Nancy' was released by Topic in 1964, three years after the Folkways release of Larner. It was re-released on CD in 1993 with the extra space given to archive material (including Larner's Lofty Tall Ship). Many of the singers on the Topic re-issue are in the first division and know the tradition as well as any, but back in 1964 they too were heavily influenced by the prevalence of the hootenanny's insistence that songs be accompanied by ostentatious instrumentation. Times and taste and awareness move on. This re-issue of 'Now is the Time for Fishing' reminds us of the essential and the unchanging. These are the basics I don't mind getting back to. Keith Summers' Musical Traditions continues its excellent work with this welcome reissue of the long unavailable Folkways record of one of the greatest names in English traditional song - Sam Larner. First released in 1961, it had become difficult to find by the time a large audience for this kind of material had developed. I never had a copy myself, nor do I remember it being played to me by friends. I think this may, in part, have been because almost all the songs had already been taken up by revivalist singers, and were well known to all of us. Who, in those days, needed a record of songs one already knew? Hearing them now, it's easy to see what a tremendous shame this was, and how much we missed in failing to refer to the traditional source. This recording makes it abundantly clear what a tremendous singer and personality Sam was, and why those lucky enough to hear him live, remain so impressed by his performances. For the rest of us unlucky ones - he was apparently very like the Surrey-based gypsy singer Jack Smith (whom London friends may recall), and also much in the style of the lovely Johnny Doughty. 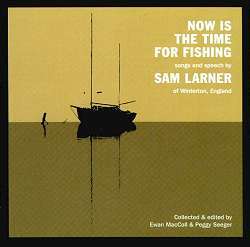 The recordings were made by Peggy Seeger and Ewan MacColl in 1959/60, when Sam was around 81 years of age. His vocal quality and control remained quite extraordinary for a man of his age. By skillfully combining his speech and singing, the editors have given us a glimpse into the life and character of the man, and one is left with the impression that singing was as much a part of his natural life as breathing. Virtually all the songs here are still very well known to the revival, but it's interesting to see how we've changed them over the years - almost certainly unconsciously. Sam's Wild Rover is markedly different, melodically - the verses having acquired the tune from If I Were a Blackbird - and it's surprising this version has not found favour (sound clip). Pleasant and Delightful has a nice little melodic twist in its tail which I've not heard much, and The Ghost Ship (essentially The Cruel Ship's Carpenter) I've rarely heard in the revival - I'd have thought this would be popular for its fearsome final verse.